Whether you're thinking about buying a diesel car or truck or becoming a diesel mechanic or simply would like to compare a diesel powered vehicle to a more conventional unleaded gasoline powered vehicle, there are a few things you need to bear in mind and understand. Each type of engine has its own advantages and drawbacks, so knowing what you need and how you need it for your personalized lifestyle is really important. Today's diesel engine is certainly not what they have been 10 or even five years back. Gone are the days of pungent exhaust and unacceptably obnoxious engine sound. Diesel engines have become much cleaner, have more power and are considerably more dependable. These are some of the reasons that we are seeing more and more ordinary automobiles with diesel engines rather than the traditional gasoline engine. Let's take a look at various differences between these two engine types. Are the Engines of Diesel Trucks and Cars Better? Theoretically, a diesel truck engine is quite similar to the engine of a truck powered by gas. They are both internal combustion engines that are designed to transform one type of energy to another type of energy. This energy then results in linear motion, which then causes forward motion to take place. The major difference is how the combustion takes place. A gas truck engine has fuel combustion come about thanks to sparks from spark plugs. A diesel truck engine has the fuel combustion take place from the heat of the pressurized air within the engine. As any diesel mechanic will tell you, although you can flame diesel fuel in the open air using merely a wick, it is significantly less explosive than gas and does not develop a flammable vapor. That means a diesel engine set won't ever vapor lock. Moreover, a diesel mechanic will tell you that the engines in diesel trucks will be more efficient because of their fuel efficiency, which is practically constant as compared to the sporadic nature of a gasoline engine which often can use more fuel to get less power. As any diesel mechanic will explain, what makes a car so appealing is its ability to accelerate swiftly. For that reason, we need to evaluate the performance difference between both engine types. Because engines in diesel trucks and cars are focused on torque as opposed to horsepower, they'll run more efficiently but accelerate fairly slowly in comparison. For many automobile owners, that lack of acceleration is unsatisfactory. For motorists who are looking to use their car or truck for pulling heavy loads such as campers or boats, a diesel engine makes more sense. When you compare a diesel engine to a gasoline engine, we cannot overlook the efficiency between both engines. 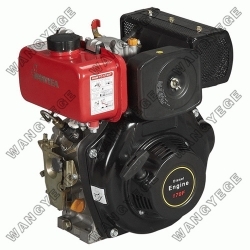 If you are looking for an engine that's going to be used long-term, then a Gasoline Power Generator is going to be best for your needs because you will save money over the lifespan of the engine. With 20 - 30% less fuel consumption, the savings really can add up. Diesel engines also have a longer lifespan than their gasoline counterparts. A typical diesel engine lasts around 350,000 miles before needing an overhaul, the gasoline counterpart is good for about 120,000 miles. Should you be looking for short term benefits, however, then a gasoline engine will likely be for you since it will take a few years for a gasoline engine to be less cost effective overall than a diesel engine. Ultimately the environmental advantage of using a diesel engine is what shifts the debate in favor of using it primarily. The engines of diesel trucks and automobiles produce only a minimal quantity of carbon monoxide, so minimal, actually, that they can be used underground. Less carbon monoxide impact on our atmosphere means a healthier planet, and that's something we should all be striving toward.